DENVER — Denver International Airport was ranked fourth in the nation for most firearms found at TSA checkpoints in 2018. In a new report published Thursday called “ TSA Year in Review: A Record Setting 2018 ,” Transportation Security Administration authorities said staff at DIA had found 126 firearms in carry-on bags at the airport. In 2017 , staff found 118 firearms, and they discovered 98 in 2016 , according to TSA. 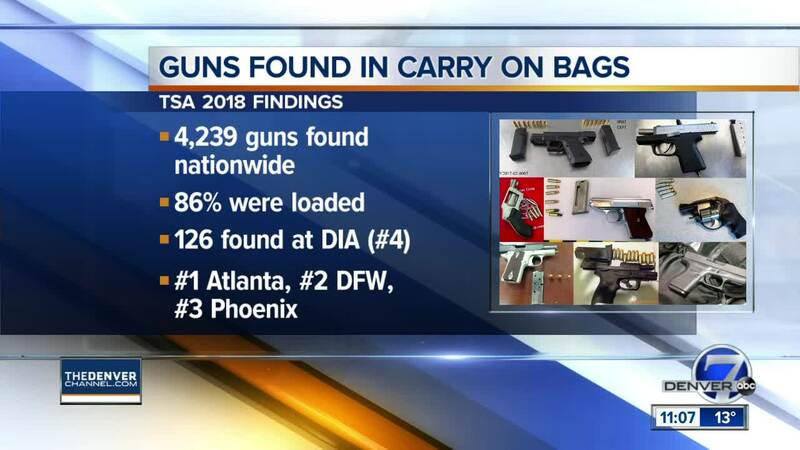 DIA was ranked after Phoenix Sky Harbor International Airport (129 firearms found), Dallas/Fort Worth International Airport (219 firearms found) and Hartsfield-Jackson Atlanta International Airport (298 firearms found), which are all major airports in the United States. DIA was ranked as the No. 5 most busy U.S. airport , according to a FAA report released Monday.